Their newspaper of choice defines British colonies of ex-pats. Red bodies to match the “red top” of the “Sun” for the Spanish Costas; black socks for the Observer reader’s of the Dordogne; and his ‘n’ her matching Hacket casuals for the Sunday Times brigade in Tuscany. What would they read in the Alpujarras? I had no idea and I needed to know. Like many, I first discovered the existence of Las Alpujarras via Chris Stewart’s widely read book “Driving over Lemons” about an ex-pat, ex member of Genesis (his relationship to the band being rather like Pete Best’s to the Beatles) and his experiences of a new life in the region. First settled by the Berbers in the twelfth century, its extravagantly picturesque villages have changed little since it became the last Moorish strong hold in Spain. Wrapped by the Sierras Nevada to the north and Lujar, La Contraviessa and Gador to the south it’s a trekker’s fantasy. Although Richard Ford in his nineteenth century handbook described the region as the “Switzerland of Spain”, imagine “ The Sound of Music” with castanets. In an attempt to find out more, I came across a dusty old copy of Gerald Brennan’s “South from Granada”, an autobiographical tale of the life of an Englishman disillusioned by his own country after World War One who settled in the remote eastern Alpujarran village of Yegen in the 1920’s. His book is the forerunner by several decades, of the slightly smug, holier than thou, new life escapism genre made popular by the likes of many dissatisfied mid-life “crisette” writers pouring out their experiences about setting up home in Provence / Tuscany / Andalucia et al served up with a dose of taking the piss out of the locals while doing so. None the less, it was an interesting read about life in an isolated location where ancient superstitions reigned supreme. 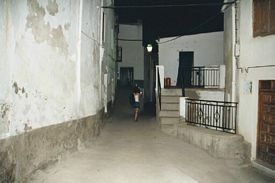 Brenan eventually fell foul of the superstition “thou shalt not get a teenage village girl pregnant” and escaped with his wife to the hills just behind Torremolinos. So, it was to be Yegen, where my wife, Nibby and I chose to stay for our first Alpujarran visit. I had already decided not to ask every black dressed, blue-eyed septuagenarian woman whether she “knew Gerald”, but to soak up the area, scenery and village life that I’d heard hadn’t changed during the 75 years since Brenan’s departure. Some additional preparation was in order however. A crash course to improve my “false-beginner” Spanish was called for. Speaking more loudly and sticking the letter “o” onto the end of each word, wasn’t going to achieve much in Yegen. I had been reminded about the time a number years earlier, when an English football manager was coaching one of Spain’s top teams and was heard shouting “mucho movemento” during a training session prior to a major match. He was sacked two days later. I didn’t want to be hounded out of Yegen by a “mucho movemento” moment as ultimately I suppose Brenan was. After a short-flight from London to Malaga, I suspected that we were the only two passengers to head inland from the airport. The feeling was reinforced after I’d asked the cropped t-shirted teenager sitting next to me where she was heading. “TORREMOLINOS” was the singled word response. “Going to spend some time on the beach then” I responded trying to generate a little conversation. “Wow – is there a beach there as well!” she shouted back ecstatically. Lost for words I had to end the conversation, no doubt rightly convinced that she wasn’t going to be a Brenan fan. As the hire car pointed north, leaving the Costa behind at La Rabat, and began to climb the Sierra Contraviessa, towards the Alpujarras and Yegen. It felt as if we were heading into unchartered ex-pat territory. I was wrong! The cast of characters were about to meet, was testament to the fact that you didn’t need to have read Brenan to have “discovered” the region. Firstly, there was Elrique Garcia Gonzalez Bourbon de Cruz. Despite having more Spanish names than a Madrid phone book, Elrique was in fact a Russian, brought up on the Asian side of the Urals. With his bare torso, mohecan hairstyle, wild eyes and horse like teeth, he reminded one in type of across between Dennis Hopper in the film “Blue Velvet” and Robert de Niro in “Taxi Driver”. Elrique was certainly multilingual. The only problem was that he hollered rather than spoke using all his languages at once. Having one’s eardrum battered with the machine gun fire of Russian, Tartar, German, Flemish, Spanish and English provided both a challenge an made him appear even more fearsome. If only he came with sub-titles, he could have been the lead in the type of prize winning European films that regularly get banned in the UK. His wife, Julia was his polar opposite. Hailing originally from Germany, she spoke excellent English and, when required, which was always, acted as Elrique’s translator. This was a role that required love, dedication and a dose or quirkiness. Her translation of a story concerning Elrique’s drunken sabre-wielding Cossack grandfather being sent home after a night’s partying having “sliced a few Mongols” only served to reinforce the suspicion that one should “respect” Elrique. Elrique, was actually a kind man – he must have been, because he spared us. Nibby and I first met Elrique and Julia at a bar in Yegen while we were waiting to be picked up for a half-day horse riding adventure. After being battered by Elrique’s multilingual howitzer, Julia’s softly spoken translation informed us that, yes, they owned the horses and would be our guides for the remainder of the day. After what transpired to be a thoroughly enjoyable afternoon with myself riding Boabdill, a four year old white stallion named after the last Moorish King, and Nibby riding Lara, a fourteen year old mare, obviously not named after Lara Croft, we bumped into Elrique and Julia everywhere. For about a week it appeared that whether we were buying jamon in Trevelez (at 1400m Spain’s highest inhabited village), or enjoying the fiestas in the hamlet of Juviles, or at the eastern Alpuarras’s only internet café at Cadiar, there they were having appeared at our sides as if beamed up by Scotty. I’m surprised that I haven’t seen them sitting either side of me on my daily commuter journey into London. Mecina Bombaron was, at first glance, a quiet and sleepy little village a couple of hairpin bends and a chicane away from Yegen. Ancient Andalucian men with their straw hats, bow legs and canes would always be sitting in a line, hanging out, and no-doubt reminiscing about their times as youths chasing the Moors out of the village some four hundred and fifty years earlier. Spain has many opposites to the UK. Loitering in groups and littering the streets with cigarette butts and generally getting in the way of passing traffic and pedestrians, is the preserve of the ancient and elderly in Spain, as opposed to that of teenagers back home. By day, Mecina Bombaron’s daily siesta appears to last from about 11am until 7pm when the elderly men move across the narrow road to the bar to begin their evening card sessions. One hundred metres further down the road in the Casa Joaquin at the setting of the sun, and the rising of the moon, and entirely different form of life assembles. THE EX-PAT BRIT. John and Shelly have lived in Mecina Bomberon with their daughter for little over a year. In his former life, John had two rather incongruous careers. A pub landlord in Berkshire, coupled with life as an international jet-setting polo commentator. As John told me, while chain-smoking his roll-ups: “I wore two CD’s.” CD1 played the rounded vowels that could happily with and describe the chukka with the Prince of Wales’ set, while CD2 consisted of he gruff-talking, deep throated, Phil Mitchell type voice that he used when talking to me. There was now a bonus CD to add to the product. The perfect, colloquial Spanish that he used with the locals was probably an excellent impersonation of Juan Carlos. John is now a local real-estate developer, buying pocket’s of land both in Mecina Bomberon and high above the village, building the odd property and moving them on at huge profits. “I’m selling the area out, and I hate it” he told me on CD2, “I’m just going to do it long enough to enable us to survive on Shelly’s burgeoning riding business. Shelly is also a polo expert and is determined to rival Elrique and Julia. With the land, stables, houses, languages and connections, I’ve no doubt that she’ll do it. Elrique and Julia were great people, but if you didn’t know them and had a choice for your three day and night trek to 3,000 metres high in the Sierra Nevada, you’d feel a hell of a lot more confident that Shelly was going to provide you with a round trip, as opposed to you providing Elrique with his main course. Hannah was a half Greek, Swahili speaking ex-artist who now made a living as Mecina’s leading, and in fact only, estate agent. She suffers from terrible vertigo, not a phobia to have in these parts with “S” bending roads bordering sheer drops of 1,000 metres or more. Her business partner, Jesus, is Spanish. I’m not sure whether it’s an equal partnership, since Jesus waits tables at the Casa Joaquin by night, while Hannah enjoys roast partridge and an adequate sufficiency of Vina Tinto. Hannah works the morning period from 10am until 1pm, while Jesus works the afternoon from 5pm until 9pm. By my reckoning that puts Hannah’s working day at a comfortable three hours, and Jesus’, including the bar work at eleven. Now that’s what I call an arrangement. Between them, Hannah, John and Shelly are shameless social engineers. If you don’t have the cash or the accent, you were “out” having been put off buying with tales of freezing winters, no water and electricity and insufferable bureaucracy that would make you wonder why you even considered leaving England. However, if you were Tim, who sounded like a BBC newsreader and had just mad a pile selling his house in Aberdeenshire, you were most definitely “in”. Tim looked nothing like as old as his 61 years. The only thing that gave his age away was the number of times in short succession that he told us that he was 61 and had just joined the “Royal Automobile Club of Spain”. I asked Tim what the time was, and within five minutes I’d managed to establish, not only his age and club membership, but that he was divorced, had a 27 year old son, was an ex Aston Martin car salesman, who had made his living as an artist for the last thirty years. Tim was in the fire of new love, having re-kindled a relationship with a Dutch woman that initially began and ended twenty-eight years earlier. She was now 49 and lived in Holland. After some nastiness with her ex-lover (Tim could have done with knowing Elrique) they were now blissfully happy together – apart from the 1,000 miles between them. Being Dutch, she wasn’t a keen mountaineer. “What did you say the time was again Tim?” I asked. Tim’s place had no water, water-rites or electricity. An avid reader, he would absorb his latest book by torchlight at night. It was unclear whether he was going to learn Spanish, or Braille more quickly. Together they continued their vignettes. A proposed film title of the experience sprang to mind, but “Carry On up the Alpujarras” didn’t have the right ring to it and sounded rather painful. Apart from the existence of Mecina’s magnificent six, little appears to have changed in Yegen, or its surrounds since the Moors left, let alone Brenan. Alpujarran architecture abounds. The flat roofed village houses are unique in Spain and almost identical to the Berber homes in Morocco, nestling in the Rif mountains visible at sunset some 80 miles away across the straits that provide the gateway to another world. Each day began with the Mule next door being led away for his day’s labour in the fields. As he passed our door he would break wind with such gusto that the volume would act as a natural alarm clock. It provided the call for me to head to the baker along Yegen’s narrow winding and inclining streets, laid along perfect examples of God’s contour mismanagement. My legs became thicker by the day as I assumed the posture of a ski jumper in order to make the short journey to obtain fresh bread for the day. The village women congregated in the tiny shop screaming good morning to each other as they each bought biblical proportions of loaves. Heaven only knows what effect wheat intolerance could have had in this village – they’d certainly be teaching our Mule a thing or two. Don’t expect to put on weight if you’re a vegetarian in this part of Andalucia. The tradition of tapas and raciones does not come with a great appreciation of Linda McCartneyesque food products. The nearest we came to a vegetarian dish eating locally was “Morcilla” a traditional blood sausage. The Yegenites thought that it had to be vegetarian because it only consisted of herbs and blood, but no red meat. Still, I’d be happy to trade-in London’s smog for a seat on our flat roof in Yegen, sipping a cold glass of our choice, and admiring the changing colours of the Sierras Gador, Contraviessa and on occasion the Rif beyond. As night fell, and siesta ended the sound of village life rose to the star lit sky before settling to the silence that existed prior to our neighbourly Mule beginning his next day. I deliberately did not find out what the Alpujarran ex-pat’s newspaper of choice is, because it’s still worth having some secrets. If you want to trek your lungs out and experience remote Andalucian village life living next door to flatulent Mules, it’s still possible to do it – we did. And yes of course, some of the names have been modified to protect both the innocent ex-pat and myself from Elrique.